12/20/2018 – All potato varieties that will be available for 2018/19 are now in stock. Four important tuber crops were developed in the Andes: ulluco, oca, mashua, and potato (Solanum tuberosum). The potato is the only one of them that has had much success outside the Andes, but the potatoes that we eat in North America have little connection to Andean potatoes. 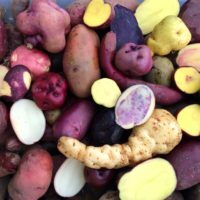 Andean potatoes have more diverse shapes and colors than the types that most of us are familiar with, but they have limitations that make them difficult to grow in North America. Either they don’t form tubers until fall, or they have very little dormancy to survive the winter, or both. I work primarily with Andean and wild potatoes, although I also make crosses with modern potatoes to try to get the best of both worlds.